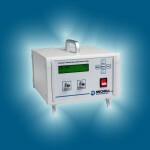 MICHELL INSTRUMENTS reports it has launched its most flexible and adaptable bench mounted analyser. The company says the XGA301 can be configured to use either zirconia oxide or electrochemical cells to measure oxygen and/or infra-red technology to measure other gases such as carbon dioxide, methane and carbon monoxide. Optional moisture measurements are also available with Michell’s Easidew Ceramic Impedance sensors for moisture content (ppm) or dew point temperature. For further flexibility, any two of these measurement cells can be combined in one unit. Michell says the cost-effective XGA301 industrial gas analyser is suitable for applications where both oxygen and moisture measurements are required. The different types of sensing cell available mean a wide variety of applications can be addressed by instrument including laboratory testing, testing the purity of inert gases and other research experiments. The XZR200 Oxygen Analyser from MICHELL INSTRUMENTS offers users added peace of mind with a built-in early warning system that alerts operators of any faults with the unit. A 3.3 V DC logic output acts as a ‘heartbeat’ and enables operators to check on the health of the sensor preventing incorrect measurements. False oxygen measurements may result in a faulty combustion process causing higher fuel costs, and leading to loss of revenue or penalties. 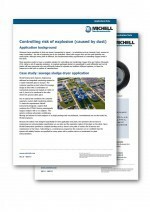 A new case study which describes a solution created by MICHELL INSTRUMENTS to mitigate the risks caused by dust explosions in a sewage plant is now available to download. Michell says storing, transporting or mixing large quantities of dust creates a risk of explosion. Because the dust particles are small, they can easily ignite in the presence of oxygen and cause a potentially devastating explosion due to the sudden release of energy. 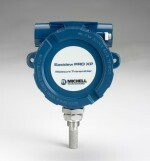 MICHELL INSTRUMENTS reports a key energy company in Germany has chosen its Promet I.S. process moisture analyser to monitor moisture levels in bio-methane before it is injected into the grid to ensure that it meets the correct quality standards. MICHELL INSTRUMENTS has announced the launch of the latest addition to its Easidew range of dew-point transmitters: the Easidew PRO XP. Michell says this explosion-proof moisture transmitter has been introduced to meet the requirements of markets where explosion-proof or flame-proof rather than intrinsically-safe certification is needed. MICHELL INSTRUMENTS has announced the launch of the XZR250 oxygen analyser for monitoring combustion control in industrial boilers and says it was developed to meet customer demand for a cost-effective, easy to operate instrument with a probe designed to cope with the high temperatures in the flue. Effective combustion control has growing importance for operators as it not only helps increase fuel efficiency but also ensures compliance with legislation on allowable emissions.